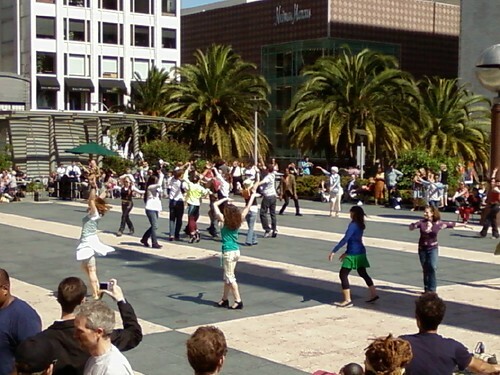 Here's what happened at 3:45 PM today in San Francisco's Union Square: spontaneous dancing to Bjork! I loved it and so did all the innocent bystanders. Sorry for the quality of the short video clip. All I had was my phone. Luckily, the weather today was gorgeous. 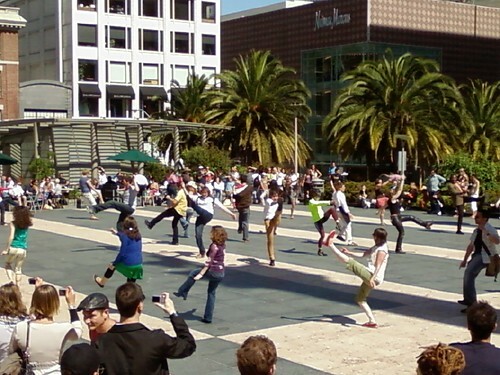 A perfect opportunity to dance with abandon in public. And, then it ended as quickly and quietly as it began. The people dispersed as though nothing had been planned. I think this kind of happy thing should happen more often. That is so awesome. I hope that happens to me someday! It was great! Thanks for putting it together.